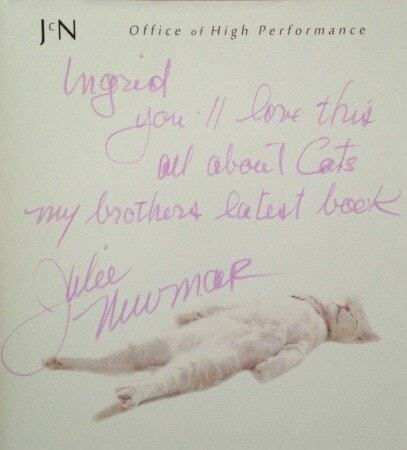 When you get an email from Julie Newmar, the original Catwoman, asking whether you would like to review ” a funny new book about cats written by my brother with me,” there is only one right answer. 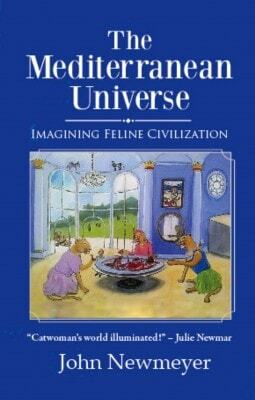 I was delighted to receive a copy of The Mediterranean Universe, along with a personal note from Ms. Newmar. The book’s cover made me smile right away – and I didn’t stop smiling throughout the entire book. This quirky little book presents a fantasy of life on a planet where cats are in charge. The author imagines life on this feline friendly planet via Felix the Cat-Man, a being that is have man and half cat. You can probably guess which half is the better one. Interspersed with lovely illustrations, cartoons, and poems, the book also features the author’s musings on evolution and what the world would look like with cats vs. dogs in charge. It includes practical advice for cat guardians, such as what to do when your feline presents you with a dead rat (the advice presented may not be for the faint of heart). The book ends with a touching essay on why living with a cat (or dog) is good four our spiritual health. I received a copy of this book from the author’s sister. Receiving the complimentary copy did not influence my review. « Welcome to the New Conscious Cat! I also received a copy of this book from Julie along with a note… I have not yet had the chance to read it, but can’t wait to do so! I love Julie and she remains my favorite cat woman ever! I can’t wait to read your review, Deb. well you must have been absolutely tickled when you received that email. I know I would have been. I just ordered the hardcover book from AmazonSmile (supporting my local rescue where I volunteer). I LOVED Catwoman when I was a kid in the 60s. She was my favorite villain. Julie Newmar was purrrrrrrfect in that role! The book is due to be delivered by next weekend. I can hardly wait. Wow, a personal note from Julie Newmar! How awesome is that!